Friday Finishes and a New Pattern! I am not sure I would call this a finish, more like a failed experiment, lol. I wanted to try a postcard and decided to just go for it and see how it worked out. I made a mess, but I learned a lot, about what not to do. It was not my best week to be doing fine work, my lyme is messing with my nerves again, so I don't have the control I need for this. I stitched all over the place, and my jerky motions made the stitches jump and as you can see, it is a mess. I will have to slow down, working too fast with free motion is another bad idea, on small pieces. I used a design from an old book I had, with country designs, perfect sizes for practicing. It is a fun project to do and fun to experiment, well worth a try if you have never made one. I will be doing more and getting used to stitching small areas and I think it would be fun to do some mixed art ones. Things I did learn was, use a 90 sized needle if you are working on Peltex, otherwise your thread breaks. Variegated threads are fun to use if you don't want to change the threads, it gives you a variety of colors on one spool. For the appliques I used Pellon fusible. For the back, I used a postcard print out and traced the lines on. You can find printables that you can use for the back. I used a Pitt artist pen to do the lines and word, it dries immediately and it waterproof. This is why you want to wait to put the back on, not a pretty sight. Even though this one was a mess, it was fun and I can't wait to try some more. I finished another small piece this week, a welcome quilt from Whimsicals. It can be found in the book, From Mom and Me. I have a few of Terri's older books and love her designs and thought it was time I made this one. 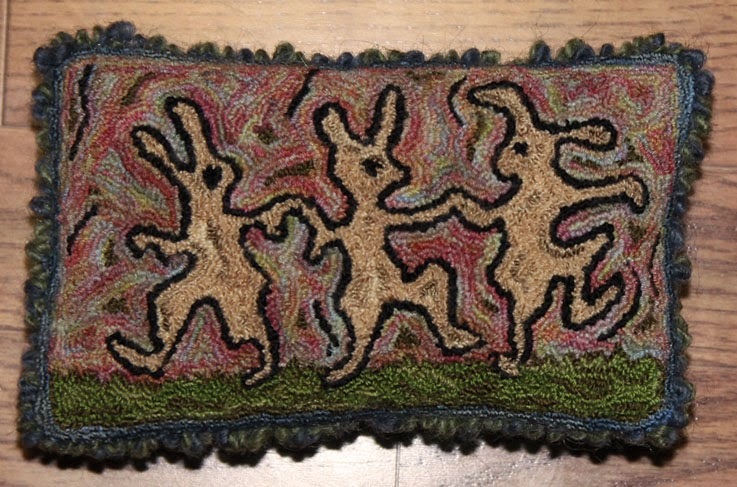 It is a simple pattern and I used wool for the applique, so it was easy to make up. It is the perfect size to hang on my wall rack with the heart piece, for now, then it will be gifted to someone. I made a simple border instead of the one that went with the pattern, but I like the black fabric around this design and with the antiquing it worked nicely. Here is the piece on the drying rack, love how the walnut ink stained on this piece. 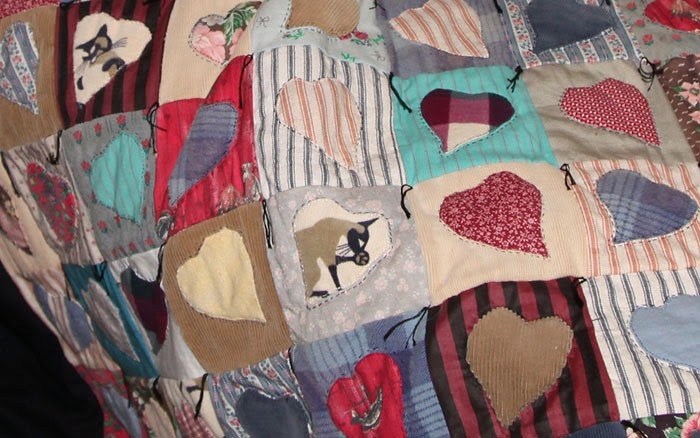 For small quilts, I water it down and then brush it on with a paint brush, it gives it a more aged and spotted look. I also dry it on a rack in the front loader, so it crinkles it up a bit and it also gives it an uneven look, but I don't like ironing it out to straighten it, since it takes the wrinkles out. Another trick I like to do is, antique the clothes pins. I soak them in watered down walnut ink and let them dry in the sun. It gives them a nice aged look for hanging quilts. I am finally getting more done and finished two pieces this week. 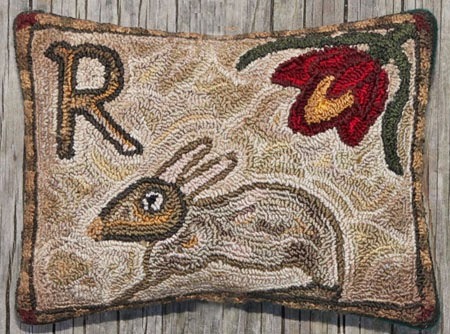 The first piece is a punch needle design based on an antique fraktur and my own touches. I loved the naiveté of the rabbit and it is a fun design to try with different color schemes. I wanted mine to stay in neutrals except for the pops of color in the flower. The original piece is 6" x 4" and was finished with walnut ink to give it an aged look. The design is for sale in my ecrater store, or you can click on the link to the left. This is an E-pattern so you receive a pdf pattern with a color photo, line drawings and a basic color chart. 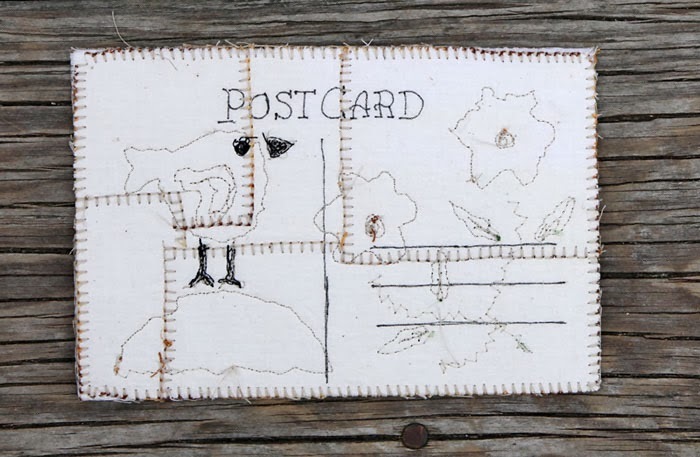 Mine was done for a punched piece, but you can also use it for rug hooking, stitchery or appliqué. I did not add an edge to this piece, I liked the simplicity of a raw edge. The back was done with a dark green wool. I took a photo outside today, and I got a lighter piece, but I still lost the antique look of the walnut stain. Another piece I finished was Hearts and Vines by Kathy Cardiff. 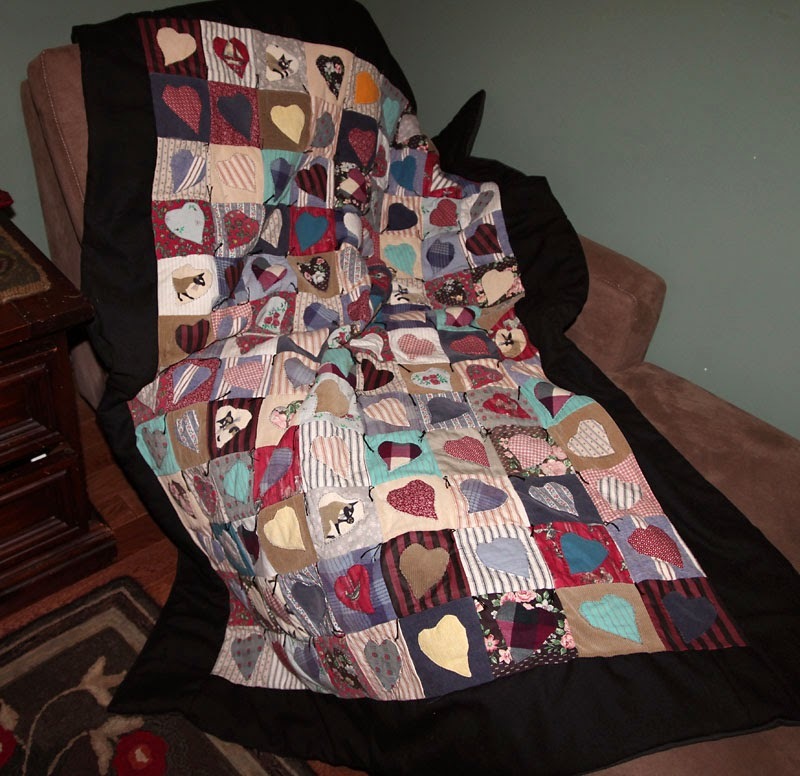 The pattern was in Primitive Quilts and Projects, Spring 2013. 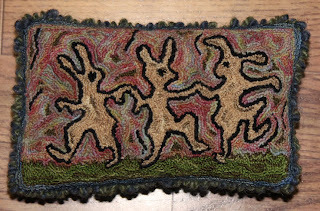 The original is done in wool and it is a beautiful piece, but I thought it would be fun to make it into a quilted piece. On the original she had her initials and date, so I added a saying and the quilted keys to mine. I also used watered down walnut ink, so the piece is much darker and yellowed in person. I wanted something for my front door and I thought it would be fun to try a rag wreath. I bought a wire frame from the craft store, half price with a coupon, so well worth getting one. If you want you can also use an old coat hanger and bend it into a heart shape. I used some thrift material that I was thought would work nice in a craft project and it was perfect for this. I snipped the cloth into 1" strips and tearing it, since they were long yardage. Then I used scissors and cut that into 6" strips for the ties. The frame has 3 sections, two in the back and the middle is slightly higher, so you want to start with the back two rows and then do the top section last. You can add less strips to the inner section since the two outer rows fill most of the wreath, but you do need a few on the inner to fill in, so the wire doesn't show. This is a 12" wreath, I had wanted a larger one for the door so I might just keep this one inside. I made up a little heart with some scraps and added that by making a tie and tying it to the middle piece. 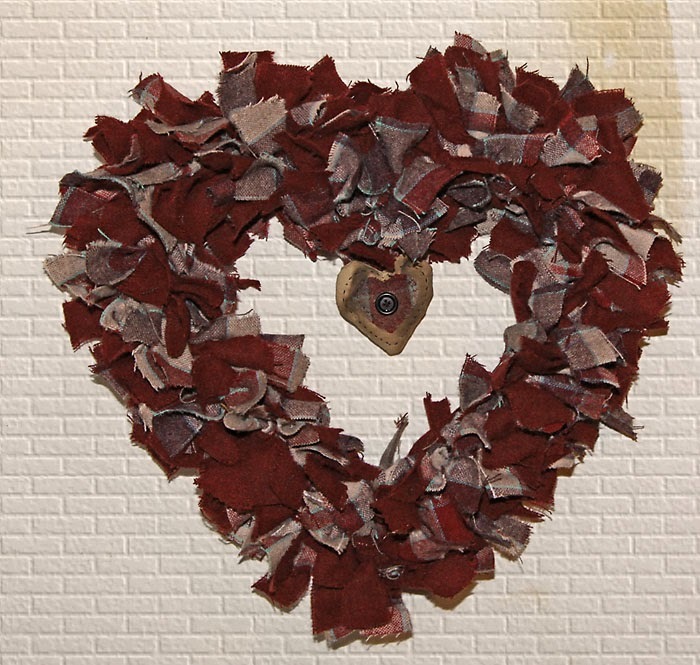 A fun project to do, works up quickly and a good way to use up scraps. I wanted to show off the wreath, so I used a little photoshop magic to make a new background. This is the fabric, I used. It is a nice soft material so it gives a nice raggedy look. If you would like a tutorial with photos, you can find one Here. I have been working on my new heart piece and I finally finished the stitching tonight, so hopefully I can have it all done this weekend. I realized I didn't have much for valentines so trying a few new pieces this year before I move onto spring and summer pieces. 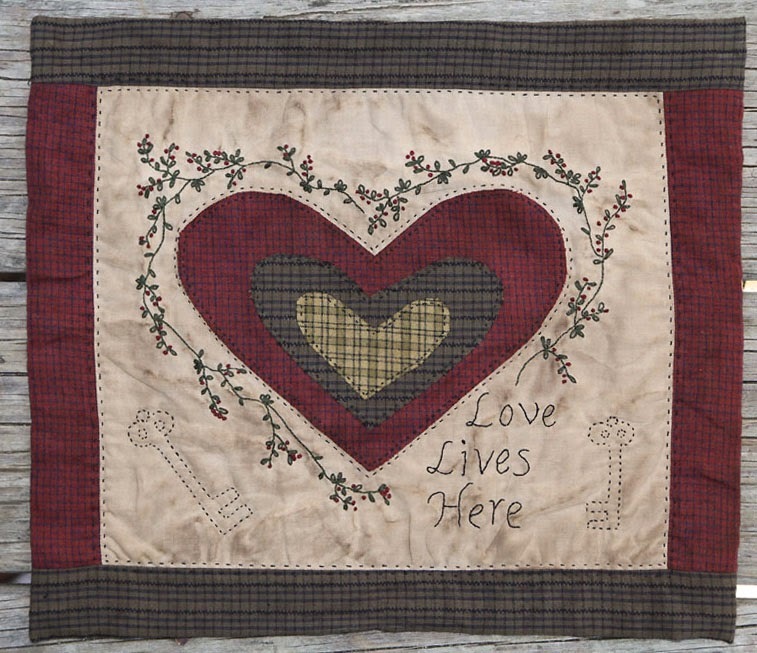 One thing I realized is, I had this quilt hanging on the ladder in my bedroom, I guess it fits well enough for a valentine piece. I am not sure if this was my first one, might be my second, but it was done in the 80's, so I guess it is vintage now. As you can see, I had no idea what I was doing, my hearts are wonky, the stitching is bad and I used tacks since I had no idea how to quilt. The fun thing about this piece is I used clothing from my kids along with scrap fabrics. The kitty fabric was a pair of corduroy pants that my sister gave me. The red floral corduroy was my daughter's farmer jeans and some flannel and pant material from my son's cloths. Lots of memories. 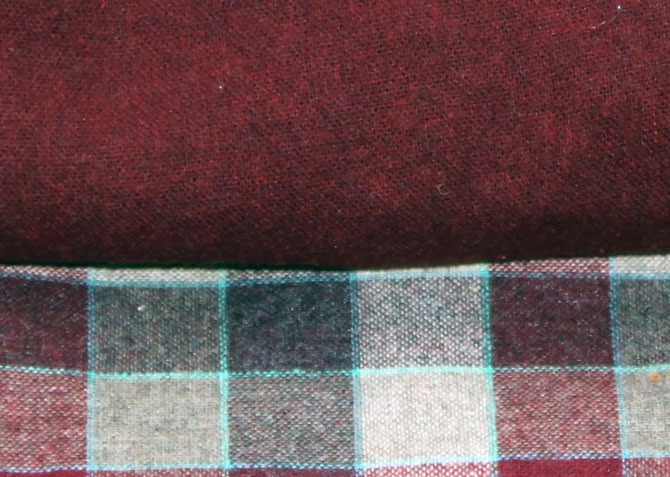 This is a closer look at some of the fabrics, there are a few pieces of ticking. I used ticking a lot in my early days, especially for rag animal dolls. The materials are darker and more worn, since it was used at one point, but I notice some seams are coming apart, so I just display it now. Well, I finally feel human enough to start working on my projects. Yesterday was the first day I could sit up and still, long enough to work on my punch needle piece. This punch needle design was a kit that I won from Ginger at Primitives By The Light Of The Moon. I have used my wool yarn in punching and found it hard to do, so I was worried about how I would do with Ginger's kit. I really love the yarn that comes with the kit, the colors are beautiful, nice variation in the colors and it punches through weavers cloth easier than floss. Another thing about kits, is they always give you too little and you run out of yarn, but Ginger adds enough to finish the piece and extra to put into another project. The yarn in the background came from the same skein. It was really fun to just punch in areas and see how the colors came out, as I went. After I finished my piece, I made it into a pillow and antiqued it. The rabbits were shades of white but the walnut turned them all brown, but I do like the antique look it has now. Of course the flash lightens it more. The border is a shade of green and blue yarn, that I twisted and sewed around the edge. 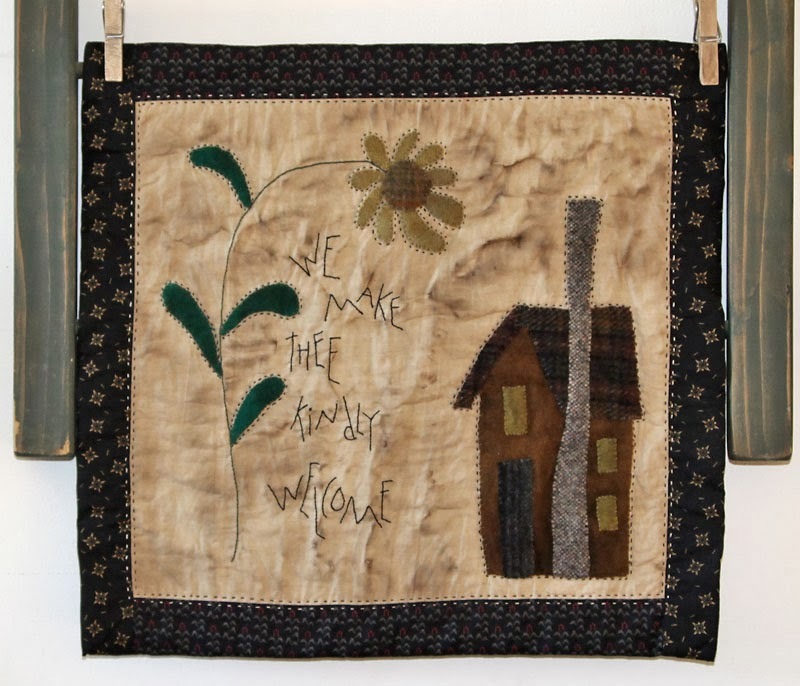 If you would like to make one of your own, you can visit her Etsy shop, Prairie Moon Primitives, which includes the pattern, weavers cloth and wool yarn. I really loved the pillow I made and I wanted to try it in a new version. I enlarged the pattern so I could do the angel in wool. I also liked the idea of making it into a framed piece, so it is just the right size to fit in an 8" x 10" frame. I decided to have a little fun and used a floral trim around her head and the addition of lace and buttons adds a fun touch. After I finished it, I antiqued it, using more on the rose trim to tone down the bright pink shades. The design is by Primitive Blessings and can be found under stitchery patterns. It was quick to make up and a fun project to do for yourself or as a gift. I still have to finish my new pattern, so hopefully it will be ready on friday. The frame is just a cheap black one, I need to go through my craft supplies and organize my frames to see what else I have. I had planned on finishing my new pattern this weekend, but life gets in the way. But sometimes it is worth slowing down and enjoying a day with my grandson. 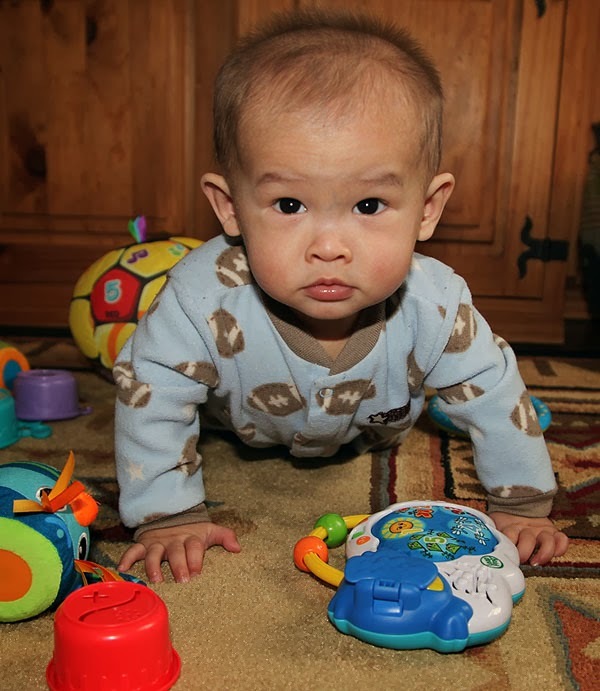 I have wood floors and that is not a great surface for a baby to crawl on, so we got a new rug. Something that covers the living room floor so he has plenty of room to play now. He has so many unique and fun expressions, I couldn't resist taking some photos. I should have a new design and punch to show you by wednesday, the punching is done, just need to decide how I want to finish it. Nick likes the new rug too, lots of colors to look at. And look who has his first teeth. 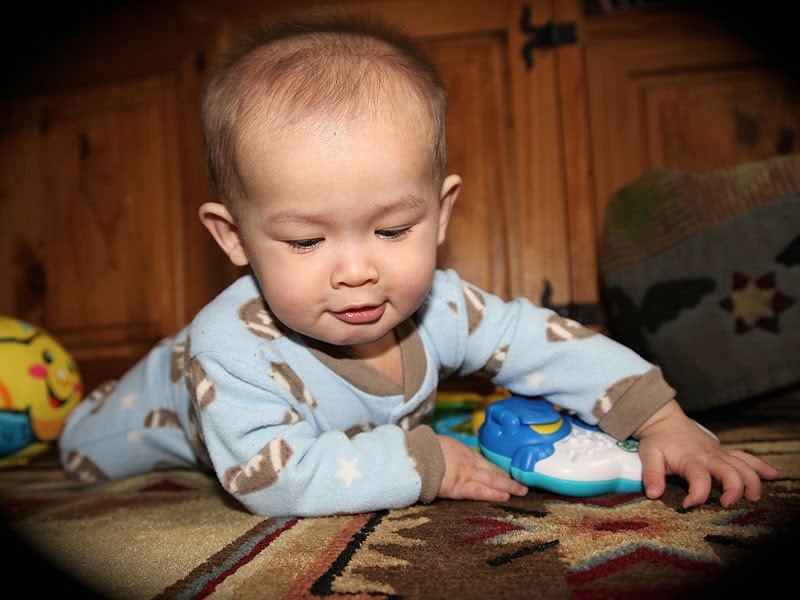 And of course he can crawl much better with the rug so he wants to see the fun toy grandma is pointing at him. If you like to take photos of your family or send them to others, a fun program to use is PHO-TO. 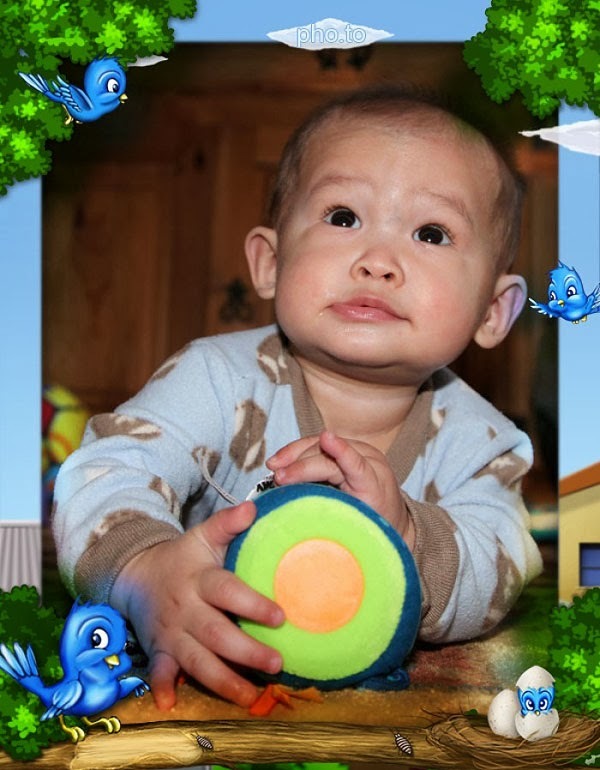 They have all types of photo editing tools from fixing a photo, resizing and lots of fun frames and effects. This will be nice for holidays too, you can take a photo and then make it into a card to send to friends and relatives. The only thing you have to remember is to crop and size your photo to fit the frame. There is no way to position the photo in the frame, once it is in. Giveaway! Chris at We Love Quilting is having her giveaways again, so don't miss out, she has wonderful surprises for her winners. I started my second block, but am so busy with the house, that I am tired at night, so I started a simple project for fun and I think it is a nice gift for friends too. I am also working on a new punch needle design, so hopefully it will turn out well and I will have a new pattern available next week. 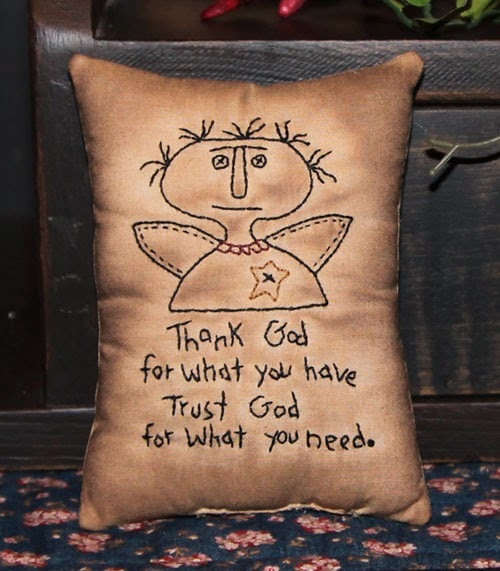 This pillow was made with a design by Tiffany of Primitive Blessings. I really like the simpler ones with a saying, great for a prim home and nice to have sayings to remind us of the important lessons in life. 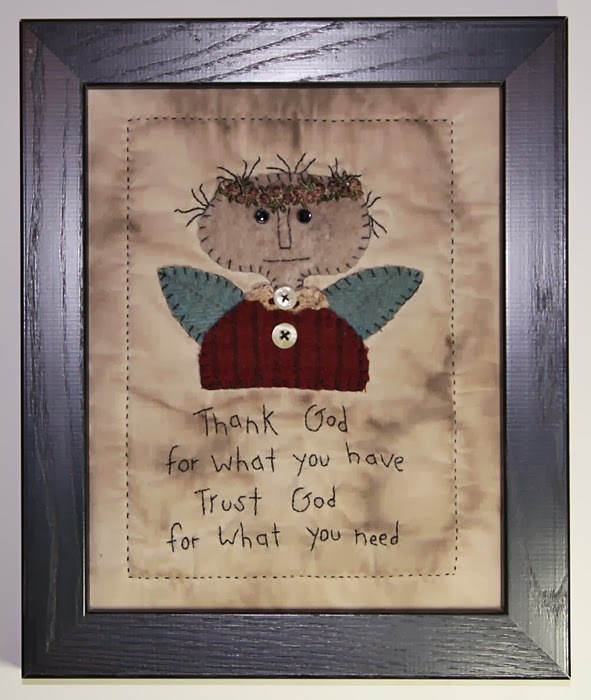 I really think I will make another, except that I will do the angel in wool and then stitched hair and saying. Maybe make it into a framed piece. If you like this design, you can find under Patterns: Stitcheries: Angels. 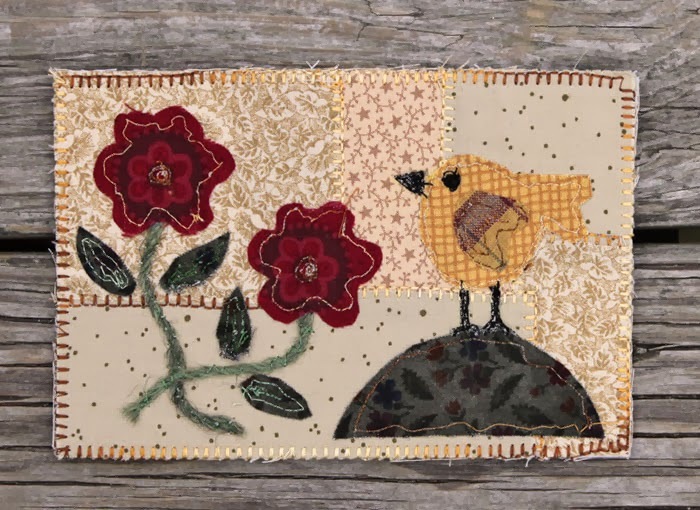 For the price of a design, you can stitch, punch or work it into a quilt or wool appliqué, not a bad deal for a wonderful design.